Colonoscopies are recommended for all adults over the age of 50, yet according to the United States Preventative Services Task Force, only one in three adults from ages 50-75 have actually had the procedure. Many people avoid getting a colonoscopy not only because the procedure itself is invasive, but also because the preparation process requires a very specific (and often, unpleasant) protocol. If a patient fails to complete all of the steps leading up to the procedure, the colonoscopy has to be rescheduled–incurring costs for the hospital and creating anxiety and frustration as the patient must repeat the preparation process once again. Using the Meaningful Engagement framework, a nationally-known regional health system was able to identify that the “moment that matters” was not having to experience this moment twice. Meaningful Research showed that patients really didn’t want to think about the process and needed alerts, reminders and resources to help them remember and follow the protocol. Meaning Maps pointed toward the need for “just-in-time” information while shopping at the pharmacy or following the procedure at home. 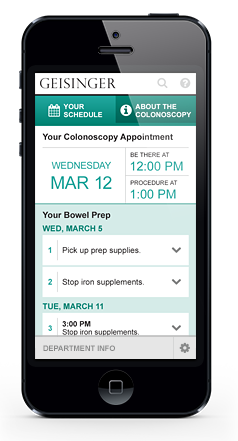 Building on meaningful research and insights, Red Privet was able to design and develop a mobile app for colonoscopy patients that educates them on appropriate preparation protocols and reminds them of critical steps through a “push” alert system. Shopping lists for preparation supplies are also included so patients can make sure to buy all the needed supplies. The app was recently recognized by the Horizon Interactive Awards for excellence in mobile applications for business. By understanding their customers needs and desires, the brand was able to create meaningful engagement in a moment that most brands wouldn’t even think to engage their customers–and gained customer loyalty at an unexpected opportunity intersection. The app was recently recognized by the Horizon Interactive Awards for excellence in mobile applications for business.